Brambleton, a master-planned community in Ashburn, VA, continually faces stiff competition in the form of new master-planned/residential communities that continue to move forward in Loudoun County. 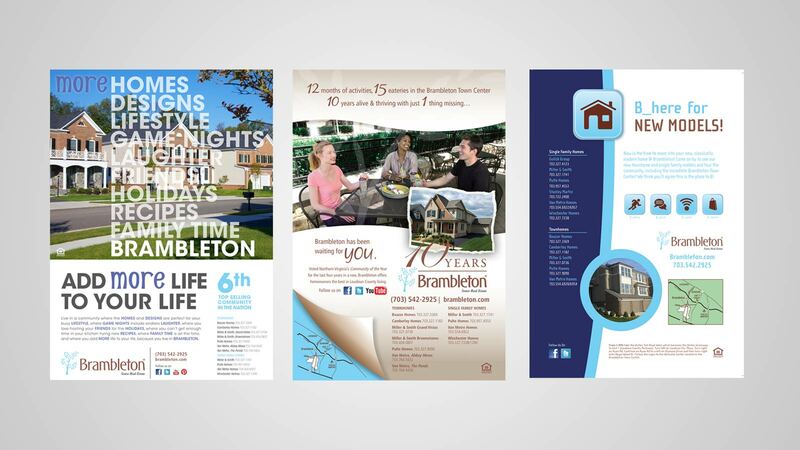 As potential homebuyers were given more choices in the area, Brambleton engaged Delucchi Plus for ongoing marketing support for both their residential and town center needs, including a new creative campaign, revamped website, print ads, digital media and additional collateral that has helped support their multiple GALA Community of the Year awards. Most recently, Brambleton and the Delucchi Plus team have taken on the Brambleton TV Channel with host Brett Tutor, who gives potential residents and current homeowners a must-see tour of the community, 24/7 on a dedicated communal channel. The Brambleton Community thrives on the established relationships and connections between its residents, town center tenants, schools and home builders. Their sense of ‘community’ is a signature trait that sets Brambleton apart from the competition. With this is mind, the website, ads and collateral were designed to attract homebuyers wanting more than just a neighborhood, but a place to call home with friends, family and a close- knit community. The website’s intuitive navigation reveals engaging content — including instant access to a visual tour — and prominent social media streams that treat potential homebuyers to an insider’s look. Pulling it all together was visually consistent photography from a year-long shoot by one photographer as well as personalized copy written to convey a sense of ownership.